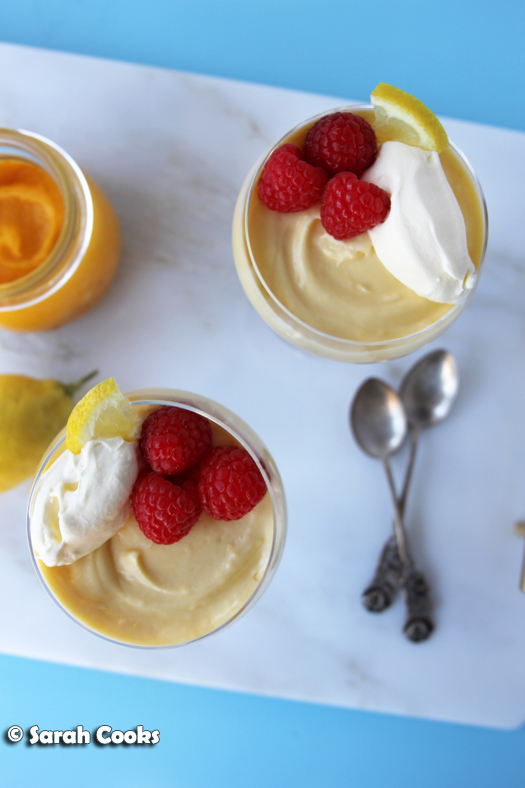 Lemon cheesecake pudding cups. These impressive desserts are deceptively simple - we have a sprinkling of buttery biscuit crumbs, topped with a light and lemony cream cheese mousse. It's summer in a glass! However, sometimes it's nice to do something a bit more desserty, and I think these dinky little pudding cups are super cute! I also like the idea that you'll have your little dessert, enjoy it, and then you move on - no slices of cake or pie staring at you from the fridge for the next week. The recipe below makes two portions, and it's easily scaled up or down depending on how many you'd like to make. (A quick tip if you'd like to halve this recipe for a single portion, you absolute champion: 1/4 cup is 62.5ml, so roughly 4x15ml tablespoons. Half of a 1/4 cup is 2x15ml tablespoons - boom). So, to make these you simply mix some biscuit crumbs (Graham crackers or Digestives) with a little butter and a pinch of cinnamon, and spoon them into your serving glasses. The moussey topping is a mixture of whipped cream, cream cheese, icing sugar and lemon curd. Too easy! I made lemon curd from scratch (and the recipe for the curd is included below), to make use of some gorgeous organic lemons that Prahran Market gifted me as part of my most recent round of creating recipes for The A-Team. However, to make this even easier you could definitely use store-bought lemon curd. I guess I think of these as the dessert version of the lemon and thyme gin sours I shared a little while ago. And as I type this, it occurs to me that you could 100% serve them together if you're a lemon fiend! Enjoy! Zest and juice the lemons. Place the zest and juice into a heavy based saucepan. Add the eggs, caster sugar and butter. Place on a low heat, and cook, stirring all the while, until the mixture has thickened and become smooth. Place the lemon curd into a sterilised jar and keep in the fridge. You will need 1/4 cup of the lemon curd for the pudding cups. Melt the butter, and stir in the biscuit crumbs and cinnamon. Divide the mixture between two serving cups and set aside. Whip the cream to soft peaks. Set aside. Beat together the cream cheese and icing sugar. Fold in the whipped cream and 1/4 cup lemon curd. Divide the mixture between the serving cups. If you are not serving straight away, cover with clingfilm and refrigerate. 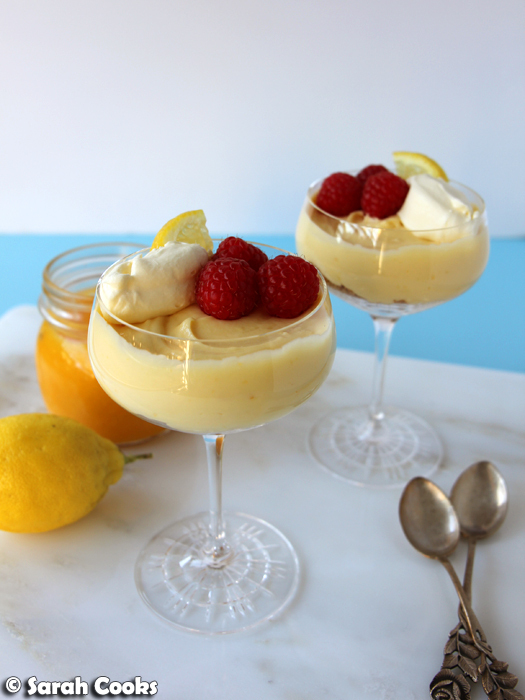 Just before serving, decorate the pudding cups with extra whipped cream, berries and lemon slices. If I can be honest i never try a lemon cheesecake pudding.